Darts is a game with lots of drama and its own celebrity cultures. 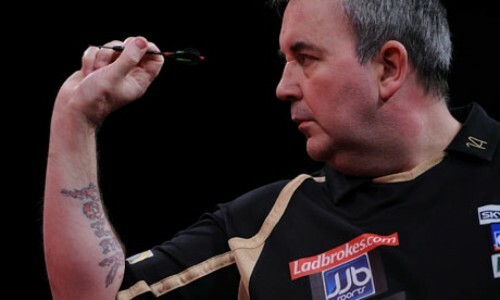 Perhaps foremost of its stars is Phil ‘The Power’ Taylor (pictured). Not called The Power for nothing, he has won an unprecedented 15 world championships and in December will undoubtedly be the favourite to win his 16th. Yet despite his remarkable achievements, which include developing a new way of throwing darts so that they stack one on top of the other in the treble 20 bed, Taylor has never won the BBC’s British Sports Personality of the Year. Perhaps this is because darts may be the most working-class of all British sports. Professional darts player and business graduate John Part is a rare example of a middle-class thrower, but then he is from Canada. Darts epitomises what we’ve now come to think of as old-fashioned White working-class culture. Taylor along with the other candidate for the greatest darts player in the world, Adrian Lewis, both hail from Stoke-on-Trent, whose main industries until the 1980s were coal, steel and pottery. Even the split within darts runs along classed lines. This split happened in 1993 when 16 darts players (Taylor among them) broke away from the British Darts Organisations (BDO), eventually forming the Professional Darts Corporation (PDC). Close friends never spoke again as it divided players into the BDO’s amateur tradition of county leagues and the PDC’s new professional ethic aligned with Sky Sports. Although the PDC started with only 16 players it is now acknowledged as having the best talent and most players at some point join it from the BDO – going back is rarely allowed. PDC tournaments have crafted darts celebrity. Each player has their own nickname and walk-on music. Some players cultivate particular personas with the crowd – notably Paul Nicholson, who wore shades for his first TV appearance and got booed, now cultivates an image as the ‘bad boy’ of darts. For a sport that doesn’t seem particularly physical, it is initially surprising that there are no women on the PDC circuit. Anastasia Dobromyslova tried for a year or two but, in a move that would never have been possible for a man, returned to the BDO and is again playing and winning against other women. But I don’t think the gender gap in sport has been much about any physical differences between men and women but more about culture; and darts more than most sports has a male-oriented culture. Women are there as supportive wives and girlfriends, as fans, and as glamour models accompanying players onto the stage in the big TV events. Despite my discomfort with darting sexism, I still love watching it and go to the PDC World Championships every year. Darts celebrities are some of those who matter to me, who capture my imagination and who have helped shape how I see the world, but the purpose of our research is to find out if and how darting and any other celebrities relate to how young people imagine their futures.